A knife consisting of a long blade (between 20 cm and 38 cm (8 and 15 inches)), shaped specifically with a pointed tip is known as a carving knife. 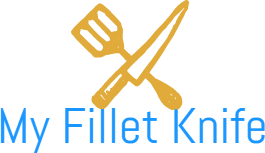 A carving knife is used for more exact slices which is the characteristic of the knife that is used to slice meat, chicken, roasts, and any large cooked meats. How to Use a Carving Knife? It is normally used in the kitchen by chefs for carving a chicken or turkey and they are also used to slice big roasted meat. Being one of the smoothest and sharpest knives it is the safest knife to use in the kitchen because of the fact it is sharp. Using it is also easy as you don’t struggle when carving or slicing thus becomes easy to handle. To use a carving knife properly one must know all the different types and details like the shape, the blade and how the tip matters. The knife which is used by chefs’ and normal people is the one with the silky straight blade and a pointy tip. It can carve or slice with ease and precision that’s why it is preferred by all. The precision comes from the blade which needs to be polished and sharpened regularly with the help of grinding tools and honing tools. 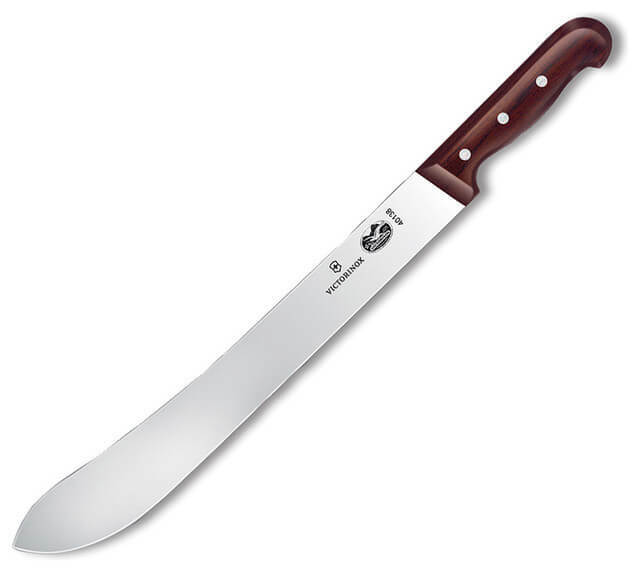 Just as the name suggests these type of carving knives have a rounded tip mainly to slice ham or meats with no bones. You can find this kind of slicers in the carving stations of a restaurant because of the round tip it is considered to be less harmful. They are more commonly known as carvers or slicers as they are used as dedicated meat slicers or carvers which is used to slice the Sunday roast or ham. It gets confusing sometimes when the same knife has different names. The serrated edge knife is also known to some as the pumpkin carving knife. If the general properties are kept in mind then the confusion can be avoided. This knife is not for slicing meat or carving the turkey. The serrated tips will shred the meat and not slice which is why it is best to use slicing pieces of bread and other rough produce such as pineapples. The round tip serrated knife is used to carve the pumpkin during Halloween. The guts and the seeds may cause some hindrance so taking them out before carving is always a good idea. The round tip knife can also be used to slice a tomato and other fruits and vegetables. This knife is more commonly used in daily life. The chef’s carving knife is only used when you slice a ham or the Sunday roast so essentially using it once or twice a week. If you are not familiar with this type of knives is because it is mainly used by the sculptors and plumbers. The knife has a smooth and short blade with a sharp tip for carving. It needs to be very sharp so that it won’t get wedged in the wood. When working with the wood carving knife you must be very careful so it is recommended to strap in the wood you want to carve. Use of leather gloves when working with the wood carving knife gives enough protection so that you can concentrate on the carving and not worry about injuries. 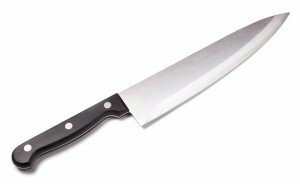 What Does a Carving Knife Look Like? The carving knife is the long and pointed tip knife. It is long so that when carving meat or any other poultry produce you don’t have to bring it back and forth all the way out. That’s why the length is generally between 38 cm and 20 cm. Also, the knife is longer than the thing you carving or slicing which is one of the main features. The pointed tip is another important feature which helps to reach around the bones and hard to reach curves while curving. The new carving knives have big dimples on the side of the blade which further helps with the carving as it creates less friction. So making thin precise slices are very easy. Although the carving knife is similar to a chef’s knife in many ways they are not the same. The carving knife has a narrower blade on the spine which is the top blunt part of the knife and that’s why it is easy to take it out back and forth. How should you clean and store your knives? The practice of cleaning the knife after use will keep the blade of the knife looking new for years to come. If you don’t clean the knife after every use as the residue of the object curved will remain on the blade and over time the blade loses it true potential. So after each use take the time to wash the residue off that are stuck on the blade. Using soap and a soft cloth or sponge start cleaning but make sure to keep the tip faces the other way also the keeping in mind the sharp edge of the blade. Wash the soap away and rinse the blade make sure the blade is dry before storing it away. If you want the professional feeling then the chef’s roll is the place you store your knives. Otherwise mounting on the wall with a magnetic strip is a popular choice. Also keeping under the cabinet or inside the drawer is another practice. I have seen my mother keeping the knives in a separate box from all the utensils and the box was kept under the cabinet. Choose the one that makes more sense to you but makes sure it is moist free and will remain dry so that no rust can form.